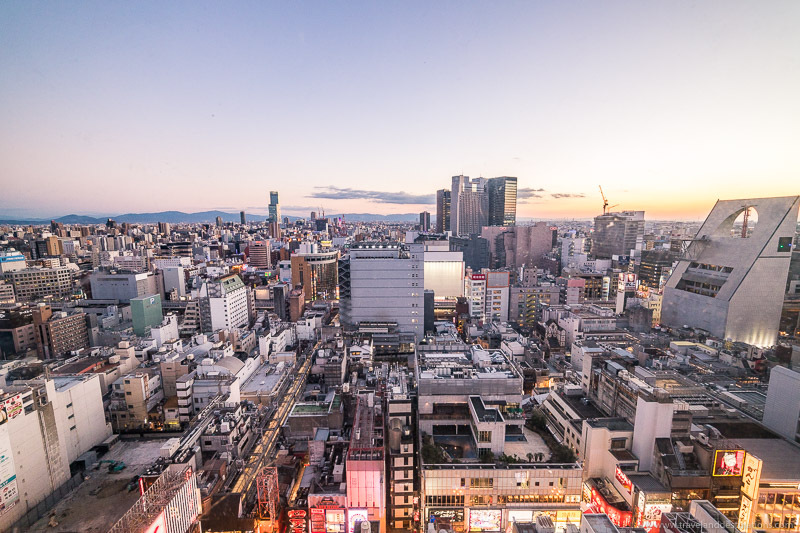 Osaka is one of Japan’s largest cities and is located around 2.5 hours from Tokyo (via the Shinkansen). 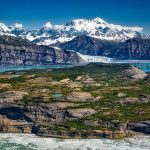 The city has similarities to the country’s capital, such as a colourful entertainment district, bustling nightlife and stunning landmarks. 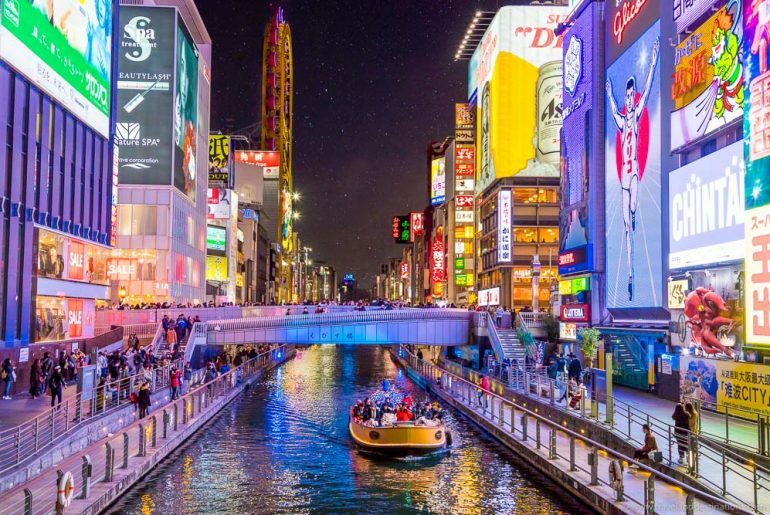 However, Osaka is also home to some unique features including the very cool Dotonbori Canal and regional dishes. 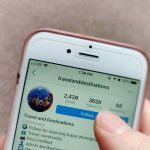 If you’re heading to the city and want to know some of the top things to do then keep reading. Here are the best things to see and do in Osaka at night. A popular spot to visit is the Dotonbori canal. Enjoy a boat ride where you’ll learn a little about the canal and surrounding area. 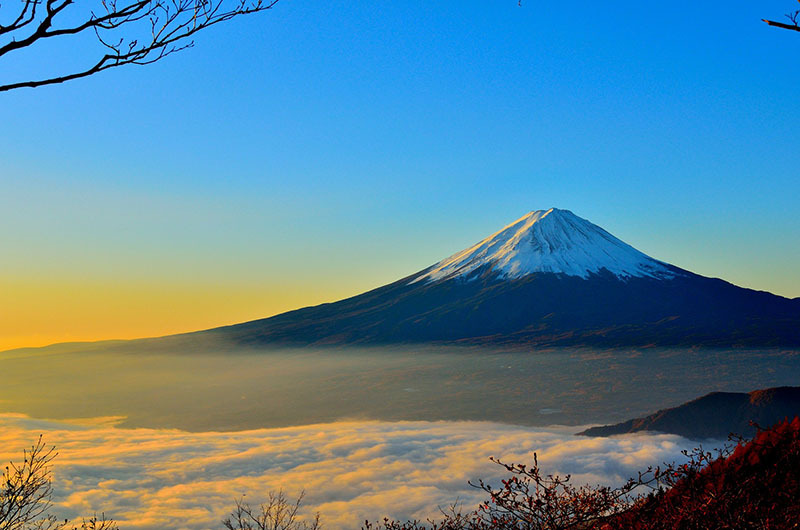 These tours are primarily in Japanese but may have some English included. However, the ride is still a nice experience either way. 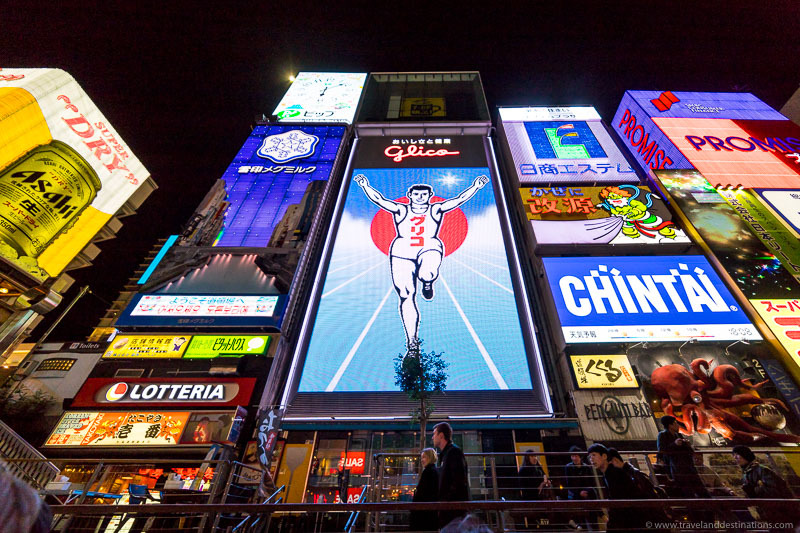 One of the most popular attractions along this stretch is the Glico billboard which signifies an image of health and is made up of around 14 million LEDs. It’s one of the cities most famous landmarks and along the bank you’ll see people getting selfies with the same pose. 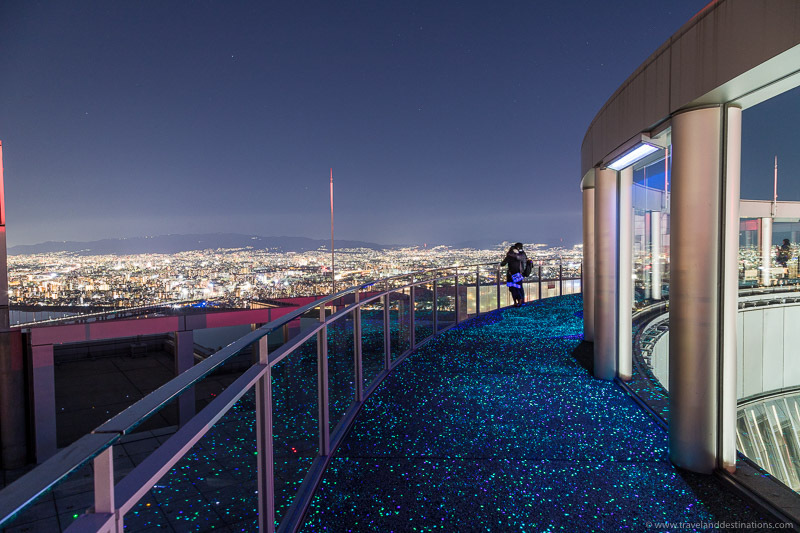 The Umeda Sky Building (Kuchu Teien Observatory) offers far-reaching views of the city. The atmosphere is also really nice with beautiful music and it serves as a peaceful spot to relax in the evening. Osaka is home to plenty of beautiful streets. 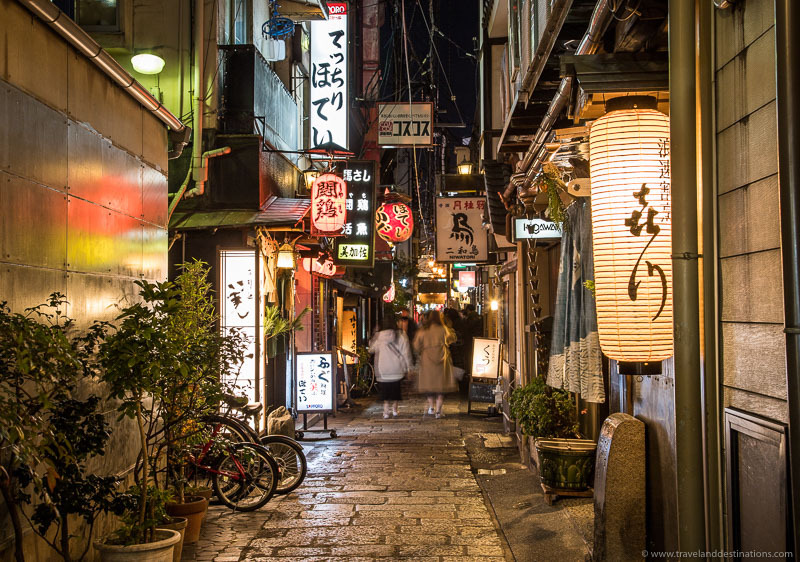 Wander these in the Minami district at night before popping into one of the local restaurants you’ll find along the way. One of the most famous landmarks in the city is Osaka Castle which has been around since 1583 and was home to warlord Hideyoshi Toyotomi. The castle has been involved in wars over Japanese history and was destroyed. The people of Osaka loved the castle so donated money for it to be rebuilt. 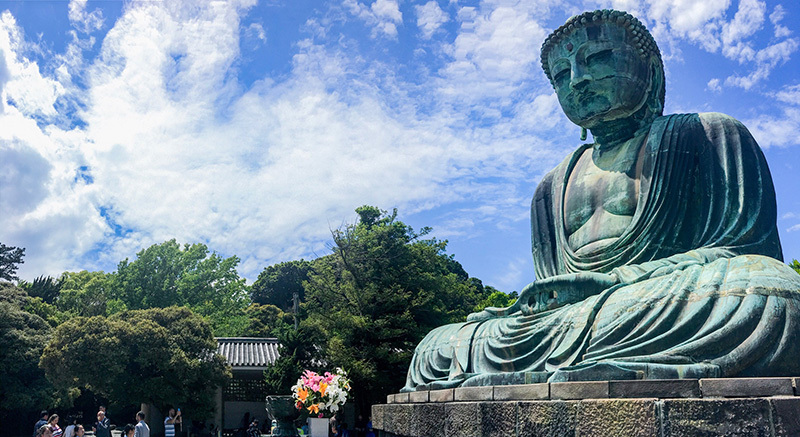 When visiting Osaka Castle you can enjoy the large castle park which is free to explore as well as a museum and observation deck which you can access during the day (for a fee). When visiting at night check out the pond to the left side where you may get incredible reflections such as below. 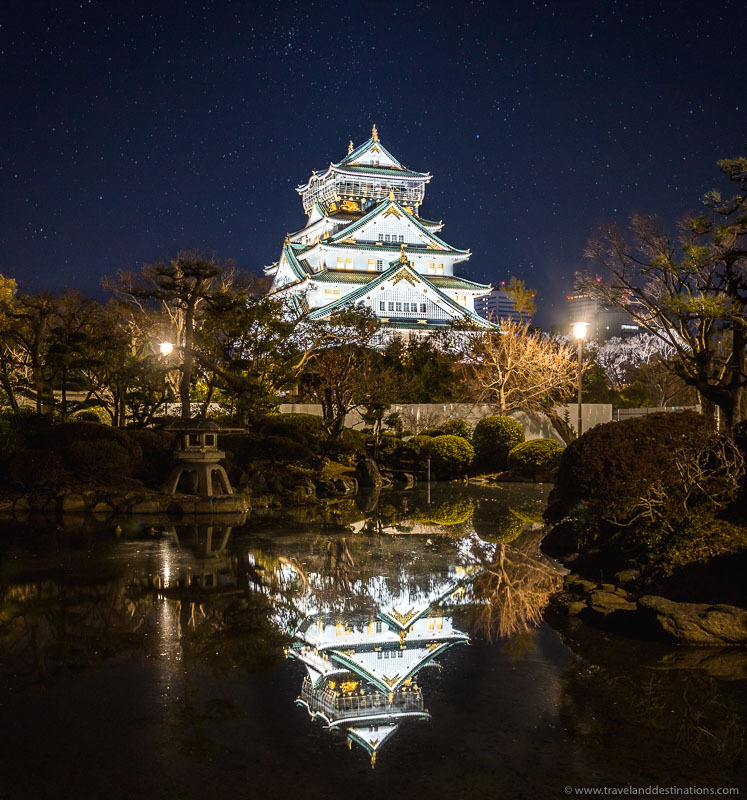 Read more about the Osaka Castle History. Abeno Harukas is Japan’s tallest building at 300 meters tall. The top three floors serve as an observation deck. Head here at night to watch the sun go down and enjoy 360 views of the city and surrounding area. 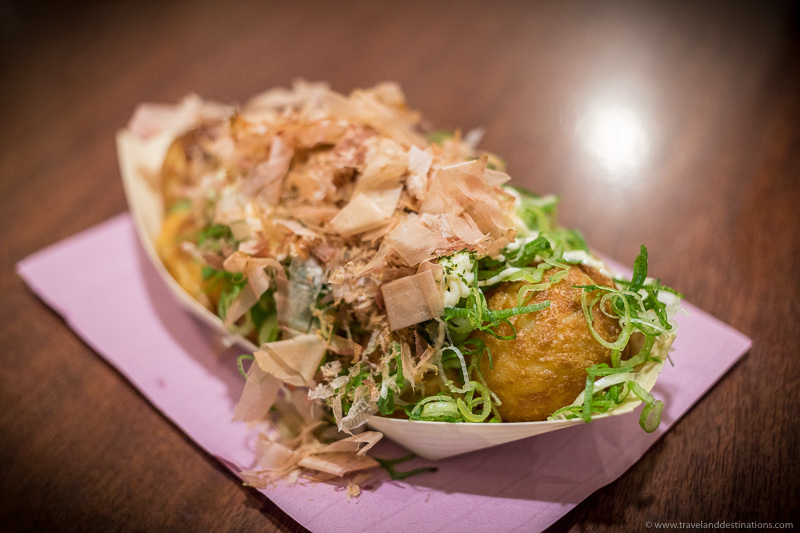 Osaka is home to some delicious Japanese delights, such as Takoyaki, which are fried balls with squid in the middle and then topped with sauce and other items. As well as Kushikatsu which is fried food and great for sharing. Finally, don’t miss Okonomiyaki which is a tasty concoction of ingredients often served on a table with a hot plate. The Tsutenkaku is a 103-meter tower that was designed by the same architect as the Tokyo Tower. The tower also serves as an observation deck allowing you to look over some of the city’s most colourful streets such as below. Overlooking the Dotonbori canal and located in the centre of the city is an odd but fun looking ferris wheel also known as the Ebisu Tower. This would be fun for the kids and takes you on a slow ride of around 15 minutes rising up to approx 77 meters high. 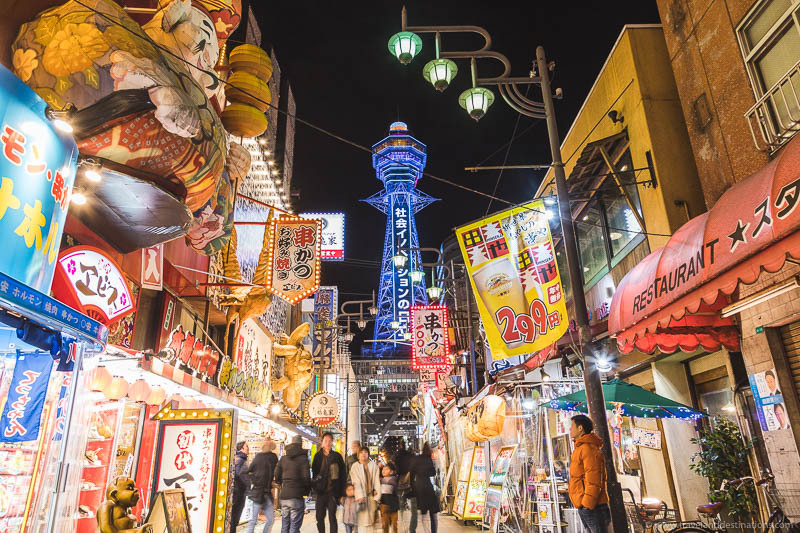 Hey Buddy!, I found this information for you: "Osaka at Night: What to See and Do". 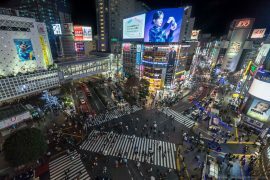 Here is the website link: https://www.travelanddestinations.com/osaka-at-night-what-to-see-and-do/. Thank you.